State House of Representatives: 1839-1840, 1846-1848, 1854, 1870. Speaker of the House of Representatives of Connecticut: 1847, 1848, 1854, 1870. Republican U.S. Senator from Connecticut: 1855-1861, 1861-1867 (Chair, Committee on Pensions; Member, Judiciary, Foreign Relations and Indian Affairs committees). President Pro Tempore of the U.S. Senate: March 7, 1865 to March 2, 1867. Acting Vice President of the United States: April 15, 1865 to March 2, 1867 due to the assassination of President Abraham Lincoln (Vice President Andrew Johnson having succeeded to the Presidency upon the death of President Lincoln). A man of persistence and strong religious convictions, Lafayette S. Foster took the notion of service to his government and its citizens very seriously. His dedication to public affairs was evidenced by both the positions he held and those he did not attain, namely his bids as Whig candidate for Governor of Connecticut (1850 and 1851) and his Democratic candidacy for U.S. Representative (1874). 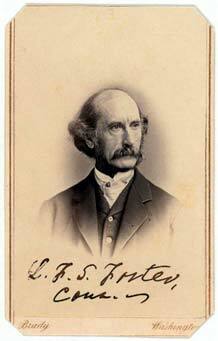 The Honorable Lafayette Foster's legal career was pursued intermittently with his political career. Brown University conferred the degree of L.L.D. on him in 1851. His counsel was well regarded: he was a close and trusted advisor to President Lincoln and a respected leader of the Senate. However, he lost the support of the Connecticut Republican Caucus back home, presumably due to his conservative views, and failed to obtain his party's nomination for a third term. He resumed his law practice in 1867. In 1869, he returned to public service to once again become a State Representative from Norwich. He was then elected Speaker of the House for a fourth term. In June of 1870, he resigned to accept the position of associate justice on the bench of the Connecticut Supreme Court. Lafayette Foster served on the Court until 1876, when he reached the mandatory retirement age of 70. Returning to the practice of law, he delivered a course of lectures on "Parliamentary Law and the Science of Legislation" at Yale from 1875 to 1880. In 1878, he was appointed a commissioner to devise simpler rules and forms of legal procedure for the state courts. He was also appointed a commissioner from Connecticut to settle a disputed boundary issue with New York State during 1878-1879. He died in Norwich on September 19, 1880, at the age of 73. Lafayette S. Foster was not only a statesman and a jurist, but also a philanthropist. He willed his personal library to the town of Norwich and his residence for the use of the Norwich Free Academy. He also endowed two ongoing academic endeavors: the Lafayette S. Foster Professorship of English Common Law at Yale University and the Lafayette Sabine Foster Prize in Greek at Brown University.